The Official launching ceremony for the establishment of the Togo National Chapter of the Pan African Climate Justice Alliance (PACJA) was held on Thursday, August 29, 2013, at Catholic Archdiocese of Lome, in the OCDI Conference room, Tokoin Séminaire. 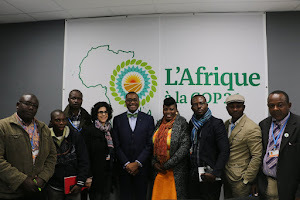 The colorful event was attended by 27 Civil Society Organization, along with senior government officials from the Ministry of Environment and Natural Resources, the Ministry of Energy and Mines in the Republic of Togo. The launching ceremony gave a better understanding on the need for alliance building/networking and presented an overview of the UNFCCC Negotiation Processes and the role of civil society in key decision making process. At the opening session of the one day conference, Dr. Tolbert Thomas Jallah, Jr. Treasurer of PACJA, speaking on behalf of the PACJA Secretary General, made it clear that there was an urgent need for African CSOs to take leading roles in working together to counter the negative effects of Climate Change on poor rural communities. For this to be effective, PACJA encourages CSOs in Togo to come together and form National PACJA Platforms to serve as focal points in all countries on the continent in order to accurately address relevant national climate change issues. The launching of the Togo National Platform was honored by the presence of Mr. TABO Arzouma Issa, Deputy Minister from the Ministry of Energy and Mines and Mr. Kossivi ESSIOMLE, Permanent Secretary from the Minister of Environment and Forest Resources. Mr. Kossivi Essiomle spoke on behalf of the Honorable Minister for Environment and Forest Resources, and officially launched the PACJA National Platform in Togo. Mr. Kossivi ESSIOMLE informed the Togolese CSOs working of environmental issues and sustainable development that the ministry plans through the National Investment Programme for Environment and Natural Resources (PNIERN), to create a healthy environment, where CSOs and populations will be fully involved in the good management of the environment and natural resources to mitigate the effects of climate change and disaster risks in Togo. The launching ceremony was also graced with the presence of Mr. TOMYEBA Komi, Chief Negotiator of UNFCCC who has gained special interest in the initiative taken by PACJA to back the creation of a National Platform for CSOs working on Climate Justice Programs in Togo. As a major outcome of the official launching of the PACJA National Platform, was the selection of three eminent CSOs to serve as National Focal Points.